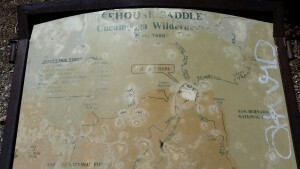 HIKE PREREQUISITE: Must have completed at least a Level 4 or 5 LATH hike with no problem. 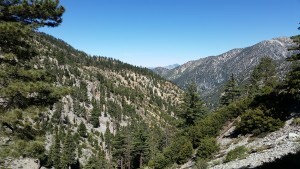 NOTE: We’ll be driving from Subway to the hike trail head at Icehouse Canyon. We can carpool from the meeting point. PARKING PERMIT (REQUIRED): Adventure Pass Required. $5 Day Pass, or $30 annual Please get this ahead of time from a local Sports store like REI stores, Big 5 Sporting Goods, Sports Chalet and other retailers prior to the hike. Please try to have this prior to the day of the hike. We recommend purchasing an annual pass ($30) and a second vehicle pass for an additional $5, which totals $35 for two annual passes. You may be able to purchase at visitor center, but it’s best to purchase this ahead of time. 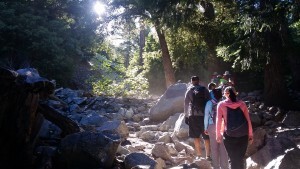 HIKE WALKTHROUGH: The trail to the summit begins at the Icehouse Canyon trail head on Icehouse Canyon Road. The hike and trail tends to be have a lot of foot traffic, providing some nice shady canopy in places and views of old cabins and ruins. We start by going along side a beautiful sounding creek within Falling Rock Canyon. The wooded area provides some a great beginning to the hike. The terrain will have some rocky very quickly with defined trail as we go towards Sheep Canyon. 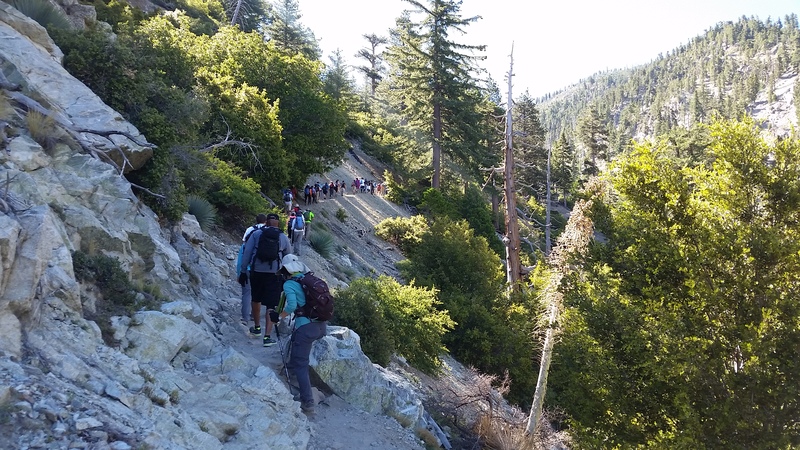 At this point, the hike will get more rocky and with more sun exposure, but some trees. We’ll take breaks along the way to make sure everyone is doing okay. 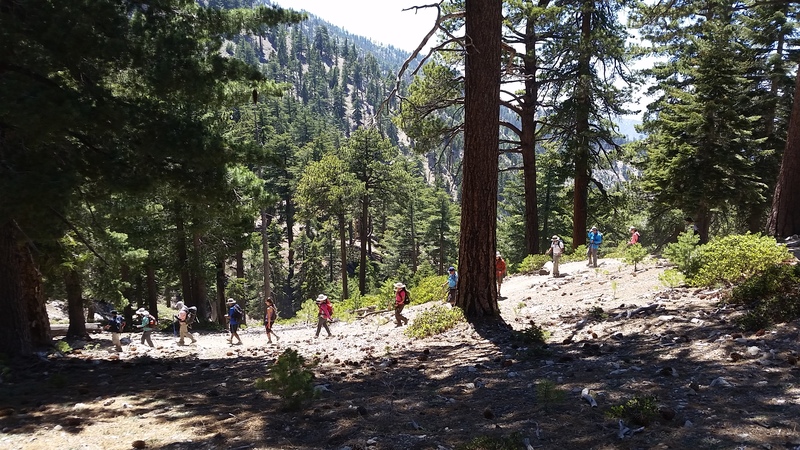 At this point we’ll keep going on the rocky terrain passing Lost Creek and getting to Delker Canyon where we will begin some good, steady switchbacks that will get us to Icehouse Saddle. 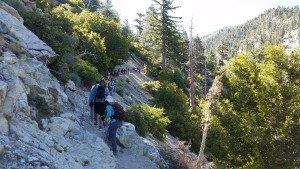 As we ascend, you’ll have clear magnificent views of the canyon behind us. Once we get to the Saddle, we’ll rest there and take our break. You’ll have a view of the other side of the saddle for another set of amazing views. We’ll then come back down along the same trail back to the trailhead. REQUIREMENTS: WATER (at least 2 to 3 liters). Make sure to bring an additional bottle of electrolyte water, or tablets to add to a bottle of water. Comfortable hiking/sports shoes with good grip. Should you need any supplies from the grocery store, please arrive earlier to do so. 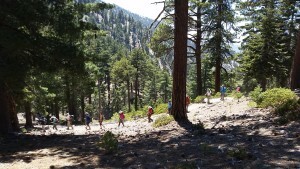 RECOMMENDED: Take some enough snacks & a lunch (trail mix, nuts, granola bars, fruits, etc.) Wear sunscreen, comfortable clothes and shoes. Windbreaker in case of high winds. Trekking poles or hiking sticks will help in uphill climbs. DOG FRIENDLY? : No. Although they are allowed in the area, we are requesting NO Dogs on this hike.